Championship club Brentford have received approval for revised plans for their proposed new stadium. 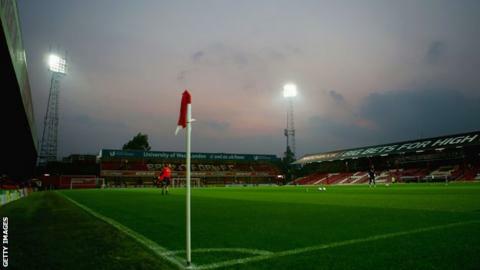 The Bees are set to leave Griffin Park and move to land off nearby Lionel Road to a proposed 17,250-seat stadium. Hounslow Borough Council approved amended plans that saw the capacity reduced from the original 20,000. "We now hope to be in a position to begin stadium construction in February," Brentford chairman Cliff Crown said in a statement. Building work, which will also include residential and office developments, is expected to be completed by late 2019 or early 2020. "We will share more details with fans on the stadium build phase early in the new year," added Crown. Brentford are expected to share the ground with a Premiership rugby club, with London Irish already chosen as the preferred licence holder.